We are primarily a leisure-cycling club but we also cater for some members who like to take part in local and regional racing leagues over the summer months. Currently we have roughly a 50/50 female/male membership of all ages and abilities. For example, the weekly Sunday spin divides into FOUR cycling groups. All Sunday spins commence and finish at The Knocknarea Arena at IT Sligo. The 9am spin usually caters for the faster cyclists. This has a nice mix of age groups and a good mix of women and men. This group usually rides an average pace of 28 to 32kph in the summer months, while this reduces significantly in the winter to about 25 to 27kph. Summer spin distance would also be 100+ km while winter spins seldom are over 90km. On the 10am, Sunday spin then we have three groups. Group A average pace 23 to 25kph; Group B average pace 21 to 23kph while group C average pace is 17 to 20kph. Distance of spins also reduce proportionally to these speeds. We also have spins on Tuesday and Thursday from the car park at Carraroe School beginning at 10am. These spins usually suit people on flexi time and night shifts and of course are ideal for retirees. Apart from the road bike spins, we also have members doing indoor spinning classes and Palates sessions mostly over the winter months. We also have a few members who like to take to the forests and trails on Wednesday nights during winter on their hardtail mountain bikes well lit up of course for good visibility. The Spring Classic 80km and 120k – on Sunday 5th of May this year. The Three Counties Tour (80km) – this year is its 25th anniversary in early September. Ladies Only Lough Gill Tour – a unique event on the last Saturday of September. Santa Cycle in aid of Lyons Club Food Appeal – Sunday the 8th of December. Apart from all that, we organise many social events for members and friends, including a Spring trip abroad for one week to a cycling training camp. This year we are returning to Majorca on Easter week. We also hold club Sundays where we cycle out to the countryside as a single group and enjoy a coffee and cake together at some luxury rest stop. We also have an autumn weekend away where we head off on a Friday and return on the Sunday afternoon and cycle either a greenway or another sportive on the Saturday. Apart from all this, we have an annual Christmas Social for all members and friends and we have many social nights out during the year such as a Pizza nights etc. Our only fund-raising activity is the Annual Table Quiz, which is held in The Harp Tavern in early March each year. I joined Innisfree Wheelers a couple of years ago and I can honestly say I have not looked back since. 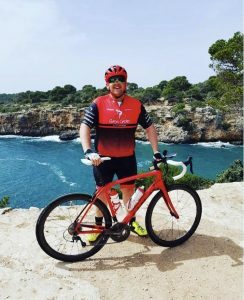 I have always been interested in cycling but had not been participating for quite a number of years so my cycling confidence and fitness was not so good. This was not an issue as I discovered that the club has a number of group spins, which cater for cyclists of all levels and fitness so it was easy to fit in when beginning cycling. On spin’s everyone looks out for one another and safety is always of most important. There is a great social scene to the club. There is always a coffee stop on the cycling routes, where we all get to share helpful tips and advice on bikes. Good group cycling techniques are constantly practiced on the club spins. 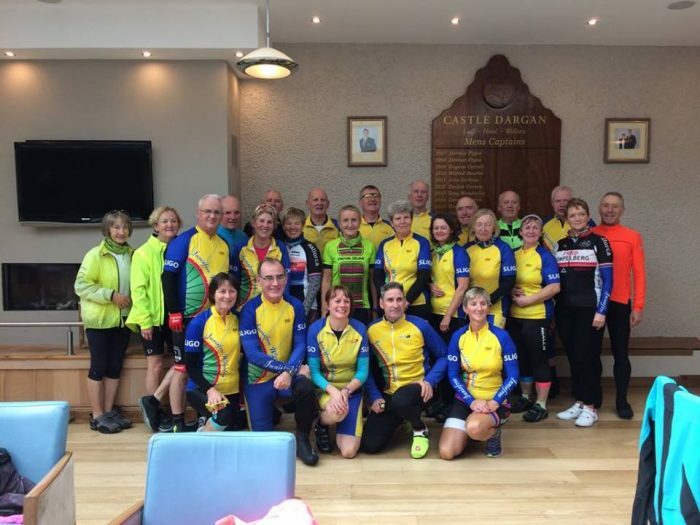 The club also runs a numbers of events through the year including Spring and Autumn Sportives, Ladies only cycle and of course the Christmas Santa Cycle. These are great events which can help encourage you to aim for a goal if you are looking to improve your cycling and fitness or just participate for the fun of it. I have been a member of Innisfree Wheelers Cycling Club for about five years now and no regrets! Well maybe… not joining sooner! 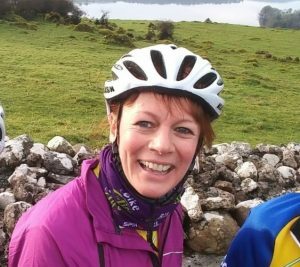 I would have been doing my own cycling locally for a while, but joining the club has given me such a boost in confidence on the bike, as well as improving my fitness and stamina on longer cycles. The members have always been so welcoming and encouraging from the very beginning and I have always appreciated that. I have also got to know so many people and formed many new friendships through the club. We have had many good nights out over the years too and they know where to go for the best coffee stops and scones in Sligo! I would encourage anyone who is considering joining the club to go ahead and join Innisfree Wheelers. Remember – All levels of cyclists are catered for in this club. You will not regret it! 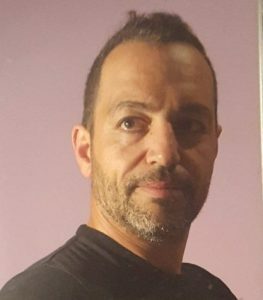 I was born in Murcia in Spain in 1977 and I am now 41 years old. I just moved to Ireland recently. I live in Strandhill with my wife, Sharon McLoughlin, and five-year-old son Kai. I teach Spanish in Ballinode College in Sligo Town. I love the Irish culture and the land and people here. Cycling in Ireland is an amazing experience. The roads are so quiet and there is such fantastic scenery even around Sligo town itself. However when you cycle out of town you are surrounded with views of lakes, mountains, stone-walls and the ocean. Of course to add to this there are plenty of cows and sheep grazing away in the surrounding countryside. To top this off, the best thing about cycling in Ireland is the people I cycle with in Innisfree Wheelers Cycling Club. They are so friendly and they gave me a great welcome when I first rode with the club. They all share the same passion about cycling as I do. This year I have upgraded my licence as I hope to do some racing. I believe that there will be a local league involving some time trials and handicapped events organised between three or four of the local clubs over the summer months. That should be good fun and I am looking forward to it. Mine is a simple story to tell, that started on a warm summers evening during Bike week in 2016, not that I knew much about bike week back then. A friend, an Innisfree Wheeler, asked me to go to the Bike Buffet, a social cycling event where you cycle to the different restaurant for each course of the meal. I hired a bike for the evening to do the cycle to the various locations in town with the longest distance been to the Radisson. During the ride, I said to my friend that I could get used of been back in the saddle, as I used to cycle to school daily a 5km each way trip. By the time the cycle was over she had arranged for me to go look at a bike that another Wheeler lady was selling. Within the following weeks, I was the proud owner of said bike, and continued to practice cycling both with my friend and on my own to get my fitness level up a bit before joining the Innisfree Wheeler Club in Dec. 2017. I have never looked back since.. Being part of the club is great motivation and an incentive to get out cycling. I will never forget my first Club spin in January 2017, “Around the Lake” approx. 60km, I had never cycled so far in my life, and during the cycle, the other club members were so encouraging and got me through it. It was a great sense of achievement to complete a big cycle with the encouragement of the group. As my fitness improved, I have gone on to complete many sportives since. All of these are great social events and cycling new routes with a group of friends gives a different perspective to the beautiful scenery we have on the west coast. Last June I completed The Abbvie Cycle Challenge, a 240km over two days cycle in aid of the North West Hospice. But sometimes the best cycles are the club cycles on Sundays or during the week where we head out, break for coffee and enjoy a chat and continue on or merry way. Even the days in winter when they it’s too cold to cycle going for a coffee and chat with the group. Recently people have asked me “Why did you take up cycling?” Friends and family have seen me do some long cycles and constantly training in the evenings. My simple answer would be “for my health”, but let me explain further. 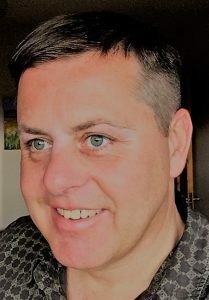 After 5 years in Dublin, I recently moved to the North West, so joining a local club was a good opportunity to meet some new people, get involved in local charity causes and improve my health. I have gone from cycling a few hundred kilometres to doing over 4,500 kilometres in 2018. Most clubs have different groups to accommodate different level of fitness and the Innisfree Wheelers are no different. One of the main benefits of joining the Innisfree Wheelers is the local club spins that are organised each Tuesday, Thursday and Sunday. The spins take in the amazing scenery along the Wild Atlantic Way and you discover some fantastic new routes around Sligo, Leitrim and Donegal. Cycling in a group makes it easier to cycle longer distances, as there is safety in numbers on the roads. 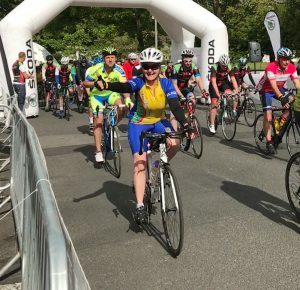 Most counties throughout Ireland have local cycling clubs that do some fantastic charity work each year for local causes. The feeling of “community spirit” throughout the Innisfree Wheelers club is fantastic and the coffee/cake stops are awesome. Each year the club organises some great sportive’s such as the Spring Classic and the 3 Counties Cycle. These fantastic 120k and 90k events brings you along a great route with picturesque views. If you just happen to live anywhere convenient to Sligo and you have been thinking of getting involved with a cycling club, I would urge you to make contact and go for it. We are a very friendly bunch and we regularly regroup to wait for everyone on the club rides. Nobody is left on their own on the road!